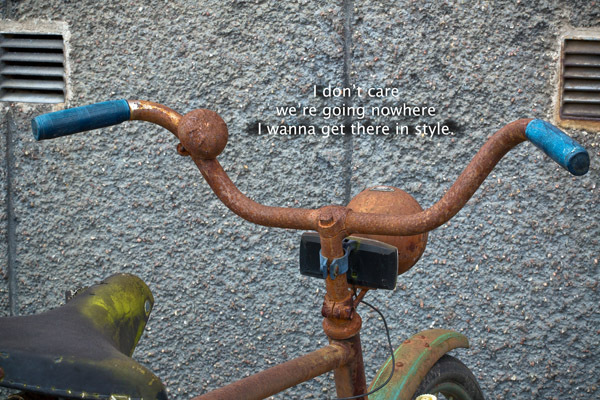 I don’t care we’re going nowhere, I wanna get there in style. Public transportation should be public. And free. The infrastructure to aid people moving around should be owned and operated by the people through taxes, thereby lowering the cost of transportation for the commuters. There will be no need for ticket booths or check points or machines or the many people involved in checking to see that each individual has paid a particular price. Gone! All of that will be gone. People will travel and the transportation system will be paid for through taxes at a fraction of the price people now pay under the present control transportation. The taxes should not affect salaries of people already struggling with meager salaries. The businesses employing the commuters and well as those dependent on them as customers must share in the taxes. Why all this high-tech and high-priced machinery with a regiment of guards to control people paying individually for the privilege of getting to work? Public transportation (PT) is a right. It’s part of the commons. People don’t ride PT for the thrill of sitting in one of its vehicles. They use PT to get from one place to another. The great majority of PT users need it on a daily basis to get back and forth to work. Consumers, another major category, travel for food, clothing, entertainment, etc., The social category visits friends and relatives, goes to parties, church or other people gathering stuff. The people want and should have a dependable, efficient and pleasant PT, something they can be proud of, at a very reasonable price, much less than they are now paying for the control system. The prevailing conditions prefer money to people so we shouldn’t expect anyone campaigning for free PT. Free PT aims to lower the cost for commuters and improve the quality of the transportation system. The public will feel the effects immediately, no tickets, no gates, no controls, just hop on. Improvements in transportation will grow organically fertilized with commuter feedback. BTW: Several successful zero-cost transportation systems function in several cities throughout the world. Rider frequency increases inevitably.